Toledo is a small town located about an hour south of Madrid. While in the capital, it is also worth to spend some time out on a fresh provincial air around. Toledo is definitely one of the most interesting one-day excursions. Getting off at the bus station I see a rising city build on a hill. On top of the hill there is a distinctive outline. This is the castle Alcázar de Toledo. In the past the castle served as a well-protected fortress that could only be conquered with strenuous climb, hard fighting and chivalrous courage. We have breakfast in one of the tapas bars on the way. A friendly host serves strong coffee from freshly ground high quality coffee beans. 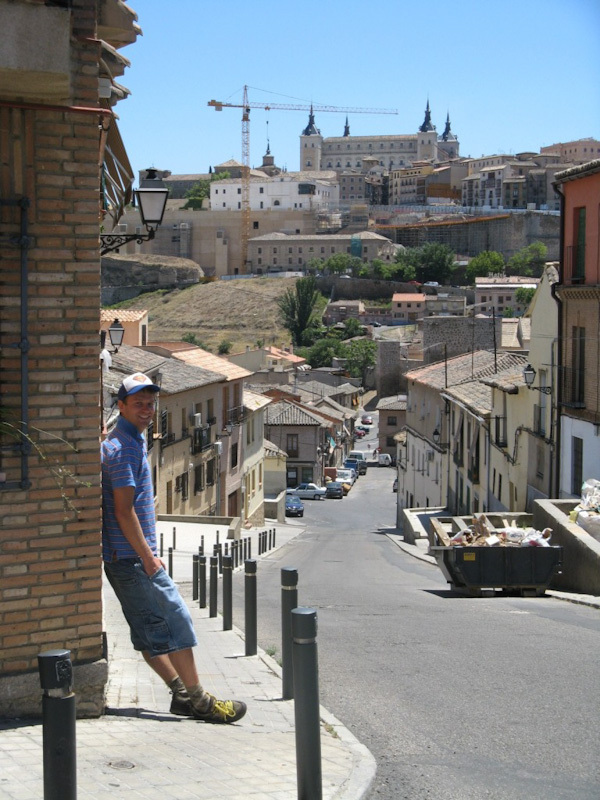 While walking in Toledo, my attention goes to the characteristic winding streets. Pastel, soft colors of buildings set a nice contrast with the intense blue sky in the background. The sizeable castle terraces offer a scenic view of the city and a plateau landscape extending out to the horizon. On the hill, outside the Alcázar de Toledo, one can see another eye-catching building. The early construction of the Cathedral of Santa María de Toledo goes backs to 1226 Anno Domini. From the outside it looks interesting and I don’t feel like visitng the inside, after all, it is just another cathedral. Again my attention goes to the narrow winding streets and small shops filled with local products. Such as a practical leather shoulder bag with a hole through which as you should pour wine and keep it handy. In this heat, however, I prefer to drink water.